We are excited to announce that session proposals are now open for the 2018 Nonprofit Technology Conference! The 18NTC will be held in New Orleans from April 11 to 13. Proposals will be accepted from July 10, 2017 to August 18, 2017. Submit your session proposal (you’ll need to log in with your nten.org account). Below, I’ve outlined a few things to keep in mind when crafting your proposal. For full details, please be sure to review the Guidelines and FAQs. You can also sign up for our free community call on July 20 to learn more. This year we’ve created a list of suggested topics for each topic category. These suggestions are based on attendee feedback from 17NTC, input from the NTC Session Advisory Group, and community feedback throughout the year in our various community spaces. Proposals are not restricted to the suggested topics so feel free to propose your best session idea, even if it’s not on the list. Here are a few things to consider when putting together your proposal(s). While attendees come from all over North America and beyond each year, there are always a high number of local folks as well. In New Orleans, this means we’ll likely have slightly more organizations with a rural focus, that work in communities of color, and that are small-to-medium in terms of size. Attendees are professionals working for and in the nonprofit sector. To make your proposal compelling, make it clear what problems your session helps address, what the tangible learning objectives will be, and any practical takeaways. Each session must include and represent a nonprofit perspective in the speaker lineup and content. Make this clear in the title and description to help a proposal gain greater support throughout the selection process. Attendees at the conference are a diverse and dynamic community. They are looking for content that reflects that as well. Make sure your proposal clearly articulates a diverse range of voices, perspectives, and content to find wider support. There are a number of guidelines for sessions at the NTC. These support what attendees have come to expect from sessions at the event. Making sure your session proposal and (and eventual session, if chosen) can meet these guidelines from the start will make for a smoother process overall. Submissions are open to the public, regardless of NTEN membership status or previous roles within the NTEN community. 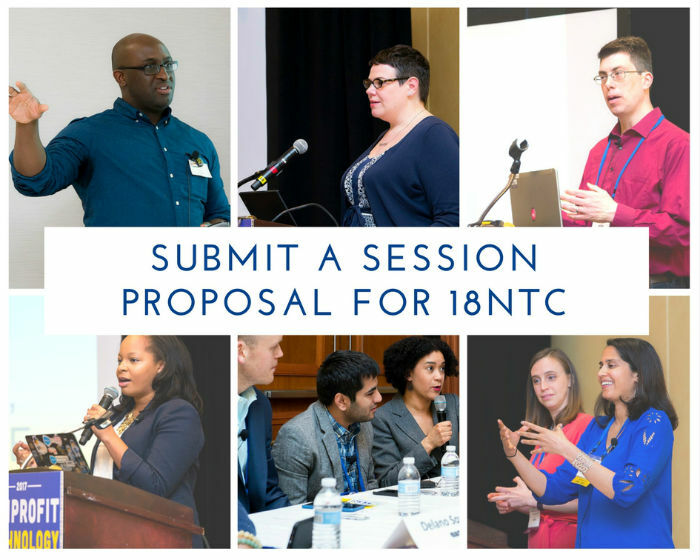 In particular, individuals and organizations who have not presented previously at an NTC and those from underrepresented communities and perspectives are encouraged to share proposals. There are multiple ways you can find support this year, from community calls to open offices hours and even our new peer review resources. Get the full details in the Guidelines and FAQ resource. Below are the slides from the community call that took place on July 20 to talk through further details. You can also access the full recording of the event here.